Free Printable Please Recycle Here Sign. Free Printable Please Recycle Here Sign, to inform all your employees, visitors or students that they can recycle at a specific place. Print this Please Recycle Here Sign free using your laser or inkjet printer, and attach near a specific container to deposit recyclable materials, like cans, plastic bottles, glass bottles, magazines, etc. 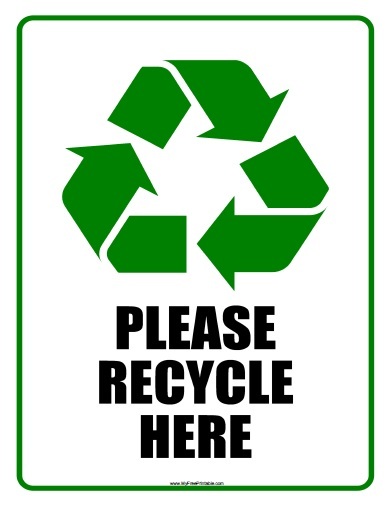 You can use your printable Please Recycle here sign as a temporary or permanent sign for workplace, school, or office. For more durability of your Please Recycle Here Sign is recommended to protect or laminate it before using with clear contact paper. Click the link below to download or print the Please Recycle Here Sign now in PDF format.